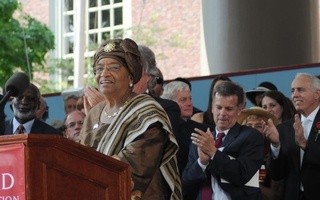 Kennedy School of Government alumna and the President of Liberia, Ellen Johnson Sirleaf, was awarded an honorary degree during the morning exercises of Commencement on Thursday. In the afternoon she delivers a speech to the Harvard Alumni Association in which she encourages its newest members to "resist cynicism." Drawing on challenges she has faced as Africa’s first elected female head of state, Liberian president Ellen Johnson Sirleaf urged Harvard’s Class of 2011 to be hopeful, resilient, and daring in facing life’s obstacles. Sirleaf—who delivered her remarks at the Afternoon Exercises of the Commencement ceremony Thursday—struck a tone that many audience members described as optimistic and inspiring. Sirleaf, who is up for reelection this November, spent much of her speech discussing her administration’s accomplishments during her first six-year term. “In five years, we formulated the laws and policies and strategies for growth and development,” she said. Since taking office in 2006, Sirleaf, a Harvard Kennedy School alumna, said she has nearly eliminated the country’s $4.9 billion external debt; increased national revenue by over 400 percent; restored electricity and tap water to Monrovia, the Liberian capital city; and reconstructed universities, schools, and hospitals. Yet despite these successes, Sirleaf acknowledged the “awesome” challenges facing Liberia, including civil war in neighboring nations, high costs, and lingering governmental inefficiency and corruption. Sirleaf—whose reelection bid is being challenged by Winston A. Tubman, a Harvard Law School graduate—praised the “truly free and fair” election process that has been established in Liberia. Sirleaf also championed the power of women in shaping social change, calling attention to the Liberian women who “fought the final battle for peace” by demonstrating in support of an end to Liberia’s civil war. While she praised the 2008 presidential election of Barack Obama as one that permanently transformed the American political landscape, she gently chastised the United States for not having yet elected a female president. “Let me remind you, America, that Liberia has you beat on one score: We elected our first female president, perhaps 11 years before the United States might do so,” she said to an appreciative laughter. Last year former Supreme Court Justice David H. Souter ’61 delivered the Commencement address. Comedian Amy Poehler delivered this year’s Class Day speech Wednesday. —Staff writer Rebecca D. Robbins can be reached at rrobbins@college.harvard.edu. Liberian President Ellen Johnson Sirleaf, a Harvard Kennedy School alum, will be the 2011 Commencement speaker, the University announced today. On May 26, nearly forty years after that first pivotal graduation speech at her old high school, Liberian president Ellen Johnson Sirleaf will be the principal speaker at Harvard’s 360th Commencement. Both graduates, Ellen Johnson Sirleaf and Winston A. Tubman, are widely considered to be the frontrunners.